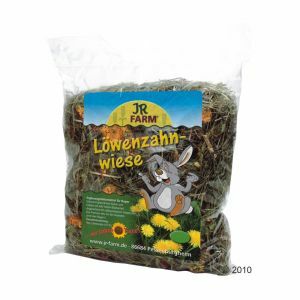 JR Farm Special Rabbit Hay - gently dried hay mixed with tasty ingredients. For the gourmet pet rabbit. JR Farm Special Hay is a mixture of gently dried grasses and herbs. It contains a high proportion of leaves enriched with healthy fruit or vegetables. Rabbit Hay is an important part of your pet rabbit's diet. Rich in fibre it helps maintain a healthy digestive system and should always be readily available. On average your pet rabbit will need two handfuls of hay for each animal each day. The roughage will also help to shorten your little bunny's teeth which grow all the time.